A reception line! For us? Truly, we felt like royalty. Our busload of travel bloggers pulled up to the Adare Manor Castle & Golf Resort in County Limerick, Ireland and we were immediately awed. The grounds were breathtaking and the stone façade of the castle was magnificent. We knew we were in for a treat, but I don’t think any of us expected to be greeted by the staff forming a reception line. It was overwhelming! We were escorted into the Library where we immediately started oohing & aahing and taking pictures. 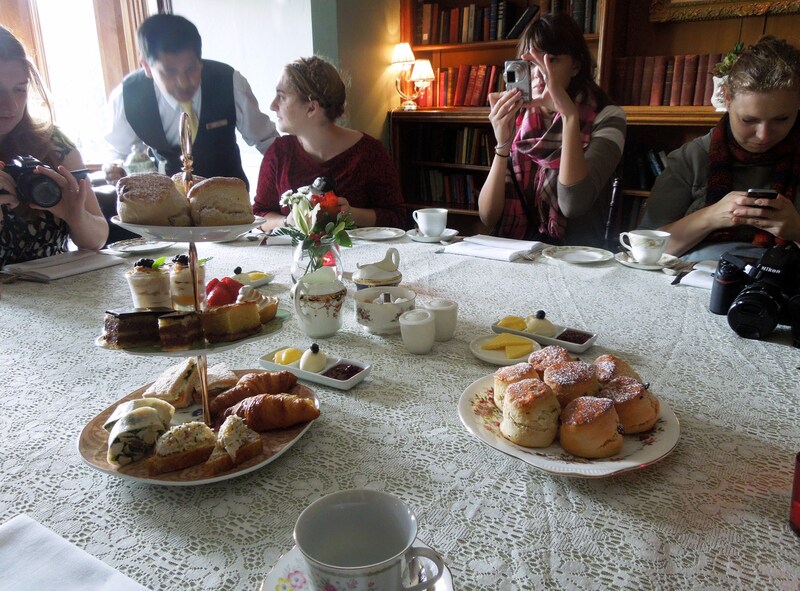 We settled ourselves into our seats and the staff began bringing out mouth-watering scones, pastries, and finger sandwiches. I don’t know about my travel companions, but I had to stop myself from giggling like a schoolgirl. I couldn’t believe this beautiful spread was for us! One of the things I most wanted to indulge in during my visit to Ireland was real Irish scones and I certainly got my wish. As it turns out, these scones have been featured in Bon Appetit magazine. You can find the recipe here. Naturally, as travel bloggers, we took a million pictures of the display before anyone could eat. We didn’t care. We were having a blast! We felt like royalty. After tea and scones, we were taken on the grand tour of this 5-star luxury castle hotel set on 840 acres of beautiful gardens and the renowned 18-hole championship golf course designed by Robert Trent Jones. The staterooms are impeccably designed with luxury in mind and have been the accommodations for celebrities such as Bruce Springsteen, John Travolta, Hugh Grant, and Tiger Woods. 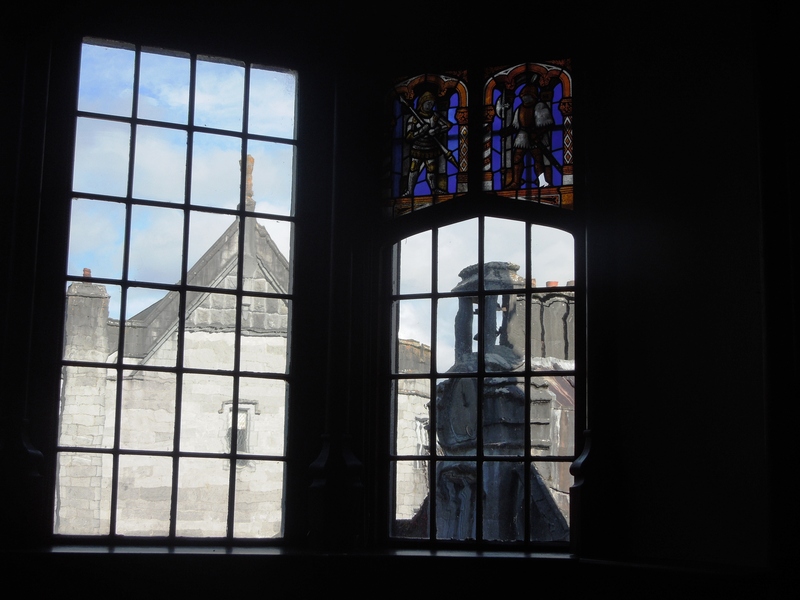 We saw their pictures hanging in the Tack Room Bar tucked away in the lower level of the castle for ultimate privacy. It was the kind of cozy room where I could imagine celebrities unwinding in comfortable solitude. That’s where I’d go. We passed the pool, 365 stained glass windows, gargoyles, and exquisitely carved wood trimming. We visited banquet rooms that any bride, or princess, would be thrilled to entertain her guests in. Our cameras clicked with nearly every step we took. 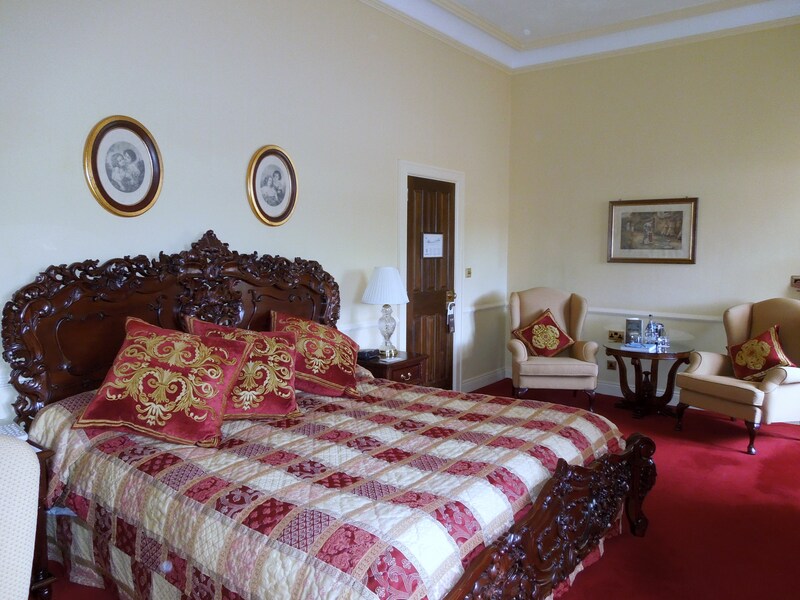 Throughout our entire experience at Adare Manor, we felt like royalty. 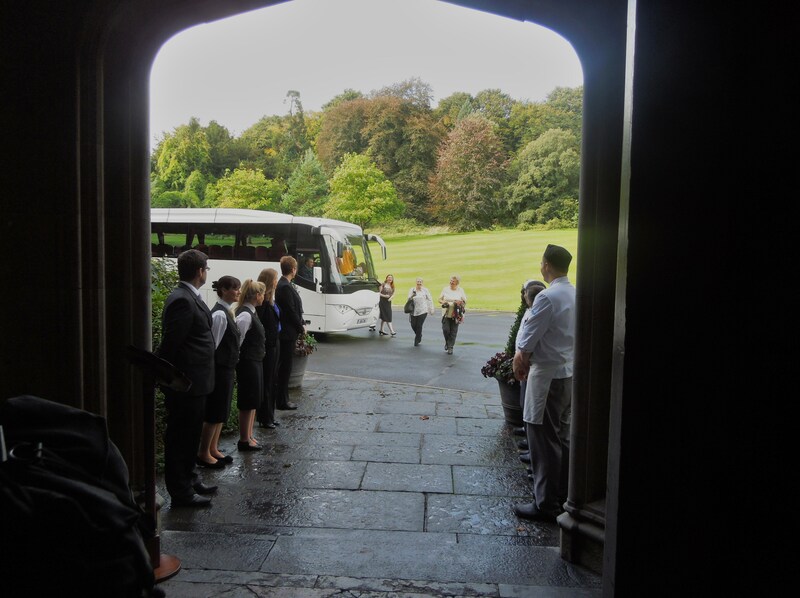 From the moment we stepped off the bus until the moment we finally had to leave the luxury behind, the staff at Adare Manor made us feel like being travel bloggers was the most incredible thing we could be in the world. Which made me wonder how incredibly special they must make every guest feel. *Special thanks to Failte Ireland for taking us there! Have you been to a place that made you feel like royalty? 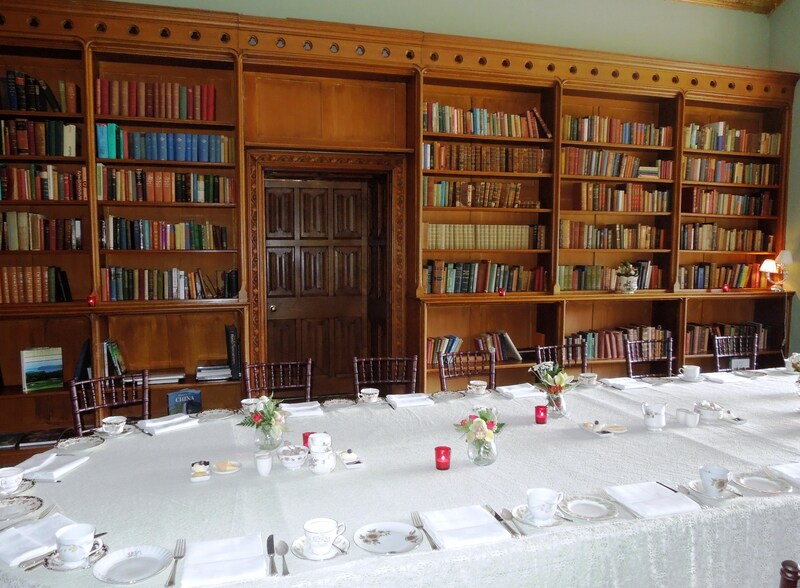 Scones and tea in a grand library, I’d be giggling like a schoolgirl too! I’m off to check out that scones recipe now as I love scones (to be honest, it’s really the clotted cream that I adore!). I’m with you. The clotted cream was superb. The combination of the scones, the cream and the library (still awestruck) made me feel like a princess. I could spend my life in that room! Years ago when my book club read ‘The Lovely Bones’ we all described what we thought Heaven would be like. I said my heaven would have a library, a cozy chair by the window, a fireplace, and sometimes it would rain outside. 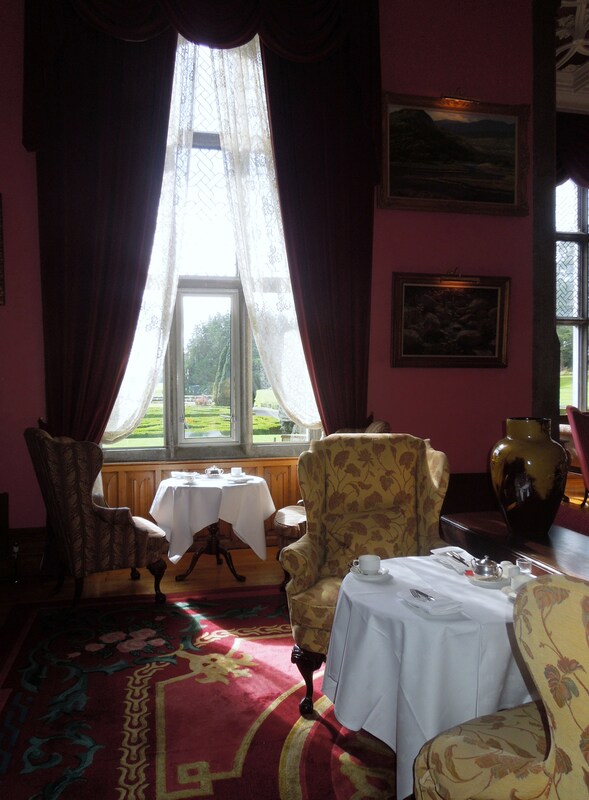 You just made me realize that I experienced a little bit of Heaven at Adare. Now I need to add scones to my personal version. well, look at who was Queen for the day! LOL! That’s how it felt. This actually reminded me of my trip to Cumberland Lodge in Windsor, which my degree program had set up for us. Although we didn’t quite have a reception line waiting for us (that is amazing, btw), I still felt amazingly privileged to have stayed there. Did you get a chance to explore the grounds as well? All that greenery is making me wish I could just dive into your pictures. We didn’t explore the grounds nearly enough. There are actually several gardens and the golf course. There’s even a Pet Cemetary! I wanted to take a closer look at that, but e only ventured as far as the garden in front, which was breathtaking. A friend of mine went years ago, and I drooled over her photos then. This is just a reminder that I need to move it up on my travel wishlist. I would love to spend a night in one of the rooms. Very expensive, though. Just taking a tour was opulence enough. What a fabulous excursion! Of course, I most love your high tea at noon experience. Yes, I think you’d love it. #EXQUISITE# although ‘exquistire’ does sound intriguing! 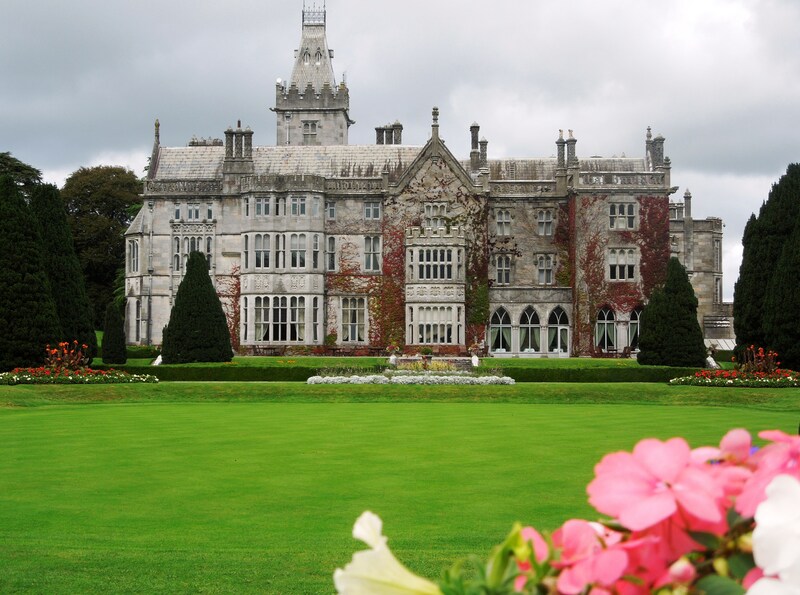 Failte Ireland certainly did you proud Julie, no sign of the recession at Adare then:-) Wonderful looking building. Failte Ireland was very, very good to us. I’m still pinching myself, wondering how I got so lucky. Every BITE was well documented. 😉 It was fun. Wow – that’s amazing! How do you get on that travel blogger bus? 🙂 Those are some of my favorite things – books, scones, clotted cream, and stained glass. 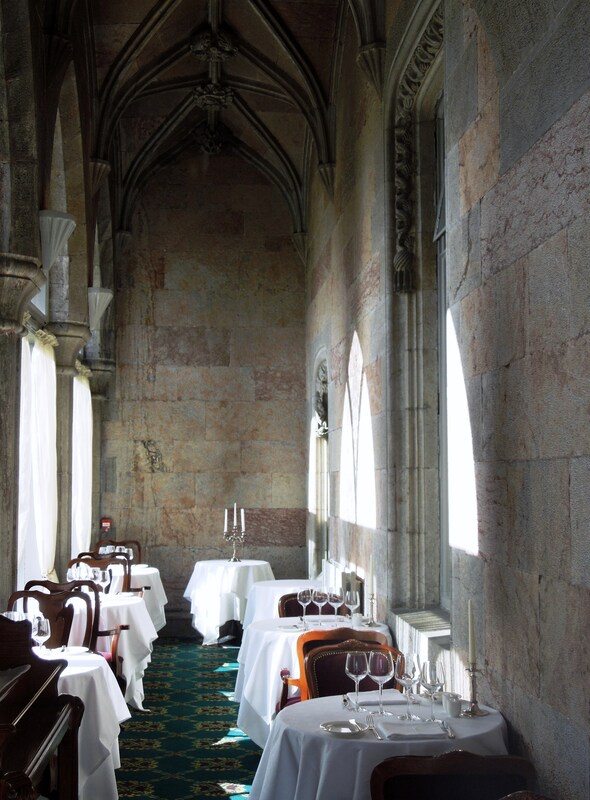 I love the photo of the tables with the old castle walls. We were invited by Failte Ireland as part of the TBEX-Europe conference. It was a once-in-a-lifetime experience as far as I’m concerned, though I’m sure every guest at Adare Manor feels as special as I did. Definitely a fabulpous manor, thanks for taking us on a tour. Your photos of the manor are beautiful! Believe it or not, the pictures don’t even do it justice. The whole place was breathtaking. What a beautiful place… Thanks for the recipe, going to try making some scones this weekend! A beautiful place, scones, tea, and everything else in between! Sounds and looks like heaven, indeed! 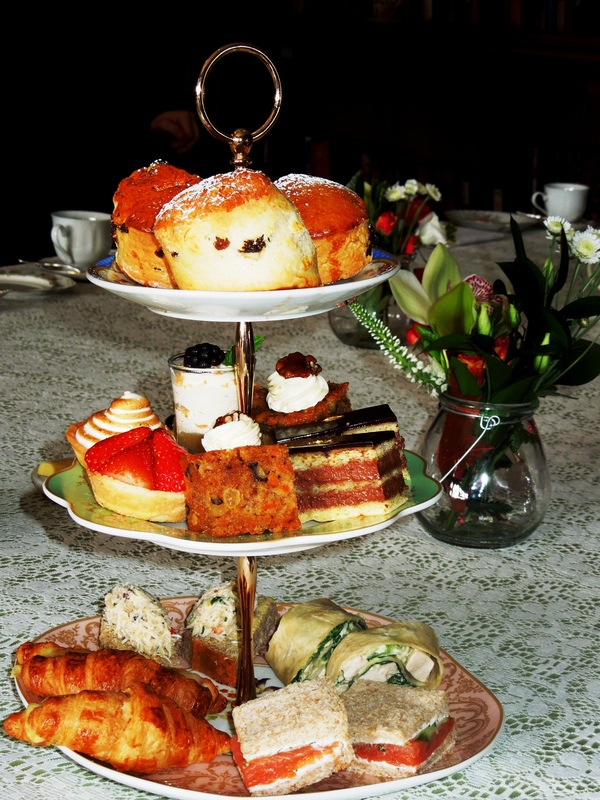 A beautiful place, scones, tea, finger sandwiches, and everything else in between! Sounds and looks like heaven, indeed! 🙂 I am hungry! It really was, Antoinette. I hope you get to go there someday. I absolutely loved it and can’t wait to go back. I don’t know why I waited so long!